Performance – check out those gains! More than 870 votes satisfied. Less time spent trying to find that page you worked on yesterday, means more time spent getting stuff done (and hopefully an early finish!). Confluence 5.9 focuses on helping you get where you need to go, and do what you need to do. Whether it's finding pages you recently viewed or worked on with the new dashboard, creating a new page with one click, or smoothly going from viewing a page to editing it without losing your place, we've made a bunch of changes aimed at making your Confluence experience a whole lot simpler. Confluence 5.9 sports a brand new dashboard, with a collapsible sidebar that makes getting around a breeze. Just like in the old dashboard, you can watch the action unfold in real time with All updates, or check out the pages with lots of activity and buzz in the Popular feed. Here's where the new dashboard really comes into its own. Get lightning fast access to your recently created and edited pages in Recently worked on, get back to that page you stumbled across yesterday in Recently viewed, and have your most important pages on speed dial under Favorites. Last but not least, we've made a place for those spaces that you hop in and out of several times a day. Hit the star icon in a space's sidebar or in the space directory to make it appear under My spaces in the sidebar. Give your site some personality by adding useful announcements, links or a happy, shiny photo from your last team outing. The whole right hand column is ready and waiting for you to customize. If you're a Confluence administrator you'll be able to edit the content right from the dashboard. Not seeing the new dashboard? Your site might be using a page as the site homepage or you may have set your own personal homepage. Head to Profile > Settings > Edit and choose Dashboard as your homepage. This will set the dashboard as your personal homepage (you can always change it back later). If you're an administrator, head to > General Configuration > Further Configuration and set the dashboard as the default homepage for the whole site, sit back and accept all those high fives from your team. No more having to spot the same typo twice! Confluence will now keep you in the same spot when you move between viewing and editing a page (sometimes referred to as 'in-place' editing). Also, to make sure the tools you need are always at your fingertips, the page data (breadcrumbs, restrictions, and attachments) and tools now appear as soon as you start to scroll up, meaning no scrolling all the way to the top of the page. Note: As we've officially deprecated the documentation theme, this feature only works in the default theme. In Confluence 5.8 we brought you CQL (Confluence Query Language), and used it to power the Content by Label and Page Properties Report macros. 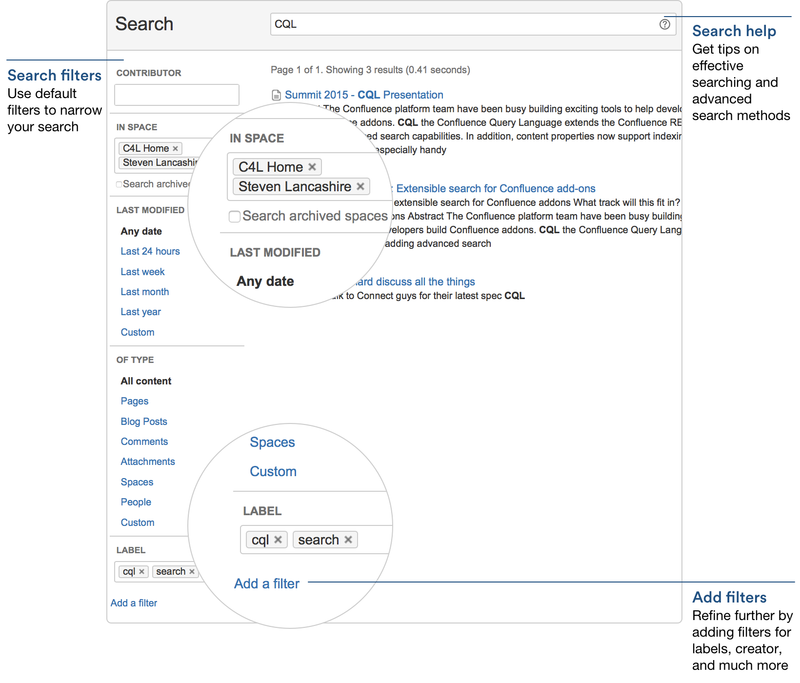 Confluence 5.9 brings that CQL goodness to search. When you do a full search, you can now add powerful filters – like label(s), mentioning user, with parent – to really refine your search. Just search, hit Add a filter and add as many filters as you need to, to get the right results. Find a page with particular labels? We love our Confluence templates, and think they're really handy, but we also know that many pages start out blank. To save you time when creating blank pages, we're taking the process from 3 steps down to 1 with our new 'quick create' option. Instead of a single create button in the header, you'll now see two options: Create (blank page) and Create from template. Page templates and other content types are still easy to get to – just choose the Create from template option in the header. We've made it easier to restrict who can edit and view your pages in Confluence. The new padlock icon at the top of the page gets you straight into the restrictions dialog (you can still get there using > Restrictions, but why click twice?). No restrictions - keep the page open to everyone (hint: use this for a quick way to remove existing restrictions). Editing restricted - limit who can edit a page, but keep it open for everyone to view. Viewing and editing restricted - set exactly who can view, and who can edit. It's is the most flexible option. The padlock icon at the top of the page changes when a page is restricted , or when it's inheriting view restrictions from another page . We'll also give you a warning in the restrictions dialog when your page is affected by restrictions on other pages. When a new user logs in for the first time, we'll give them the opportunity to watch a short video introducing them to Confluence and upload their smiliest (or most professional) profile pic. They also get the chance to watch some popular spaces, or search for and watch specific spaces. 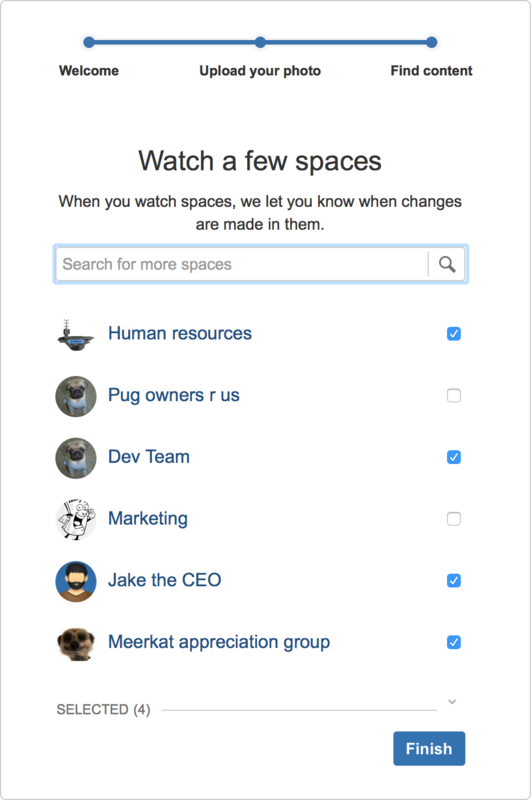 Seeing what Confluence is all about and getting the chance to watch spaces means new users hit the ground running. They should be more comfortable with Confluence from the first time they log in, and better equipped to quickly start working and collaborating. Note: Space search will only appear when you have more than 10 spaces. Marking a page or blog post as a favorite makes it easy to get back to, especially with favorites right there on the new dashboard. You might favorite pages and posts you really like, or just the ones you need to visit regularly. We've moved the Favorite option out of the menu and into the main page tools section, so it's even easier to mark something as a favorite. But seriously, we've been putting a great deal of effort into performance, and Confluence 5.9 shows the progress we've made. 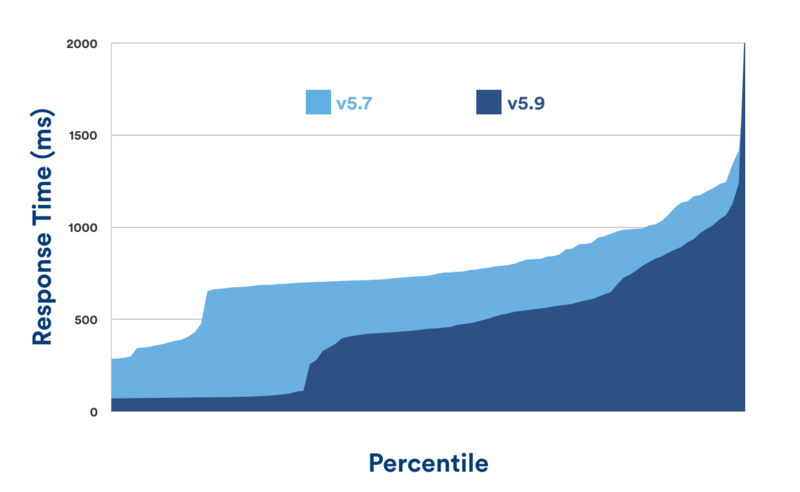 The fastest quarter of view-page requests are now 20% faster than they were in Confluence 5.8, and the slowest 5% of requests are twice as fast as they were in Confluence 5.7. Response times are based on sequential requests on a standalone server. Your results may vary depending on your hardware and usage. To make things simpler for those of you upgrading to Confluence Data Center, we've dispensed with the separate downloads and now offer a single download for either Confluence Server or Data Center. Your Confluence variety is now determined by the license key you enter when you're installing or upgrading Confluence. We've also introduced support for TCP/IP addresses when configuring your cluster nodes, so there's no longer a requirement to have a multicast address. Host Data Center yourself, or run it on Amazon Web Services (AWS)! Disaster recovery is something a lot of us don't want to think about, but definitely should. Confluence Data Center 5.9 writes search index snapshots to the shared home directory, which means it's easier to implement a disaster recovery strategy, and you may be able to complete your disaster recovery process more quickly. It's worth noting that you'll need roughly twice the disk space for your search index to allow for these snapshots. If you use JIRA Service Desk, you can now allow all active users and customers to view knowledge base articles in Confluence without granting them a Confluence license or enabling anonymous access to your site. You enable this new setting via JIRA Service Desk, but you can turn it off in Confluence at any time (globally or for specific spaces). In most cases, these unlicensed users will view pages through the JIRA Service Desk customer portal or help center; however, they can also follow a link to a Confluence page and then navigate to other pages in the same space. Allowing all active users and customers to view a space with the new JIRA Service Desk setting overrides all other space permissions. Due to the way Confluence inherits permissions, this means that any logged in Confluence user will also be able to see the space, regardless of their group membership. Currently, this is only available if you integrate Confluence 5.9 with JIRA Service Desk Cloud. Keep an eye on the JIRA Service Desk release notes to find out when it's available for JIRA Service Desk Server. Sometimes little things that make a world of difference. Here are a few of the other changes we've made in Confluence 5.9, all aimed at saving you and your team time and giving you the control you need to achieve great things in Confluence. When you copy content from the editor and paste it into another page we'll re-attach any images for you, automatically. You'll be seeing a lot less of the dreaded "unknown attachment" error. The Notify watchers checkbox now remembers your choice on a per-page basis. So if you've chosen not to notify watchers on a particular page, it'll be unchecked next time you edit that page again. Inline comments will now work when you highlight text in some macros. We've also made it a smoother experience when you can't inline comment, by adding your comment as a page comment. The Children Display and Content by Label macros both have an option to show a small excerpt of the content of the page in the list. In this release we've made those excerpts much more awesome. Simple excerpt – This is the current excerpt, that shows a single line of text from the Excerpt macro on each page. If there's no Excerpt macro, this option will show nothing. Rich content – This option shows formatted text, images and even some macros. If there's an excerpt macro on the page, it'll use the contents of that macro, or if there's no Excerpt macro it'll use whatever's at the top of the page. Give it a try – add a Children Display or Content by Label macro to your page, and turn on the rich content excerpt. Check out the preparing for Confluence 5.9 page for more information on these changes and more. Follow the usual upgrade instructions to upgrade your test site to this release. We love hearing from you, so we've added a question over at Answers for you to tell us how you're enjoying Confluence 5.9.